Dogs & Toddlers™ is the ideal program for families with dogs and babies who are soon to be crawling or walking. Often the first 3 months have gone smoothly and many families are caught off guard when their dog begins to show discomfort with the new developmental changes of their mobile baby. 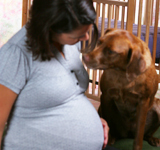 This program offers insight and proactive options for some of the common challenges families with dogs experience as baby becomes mobile.